This extension adds a configurable membership levels system for phpBB 3.1. 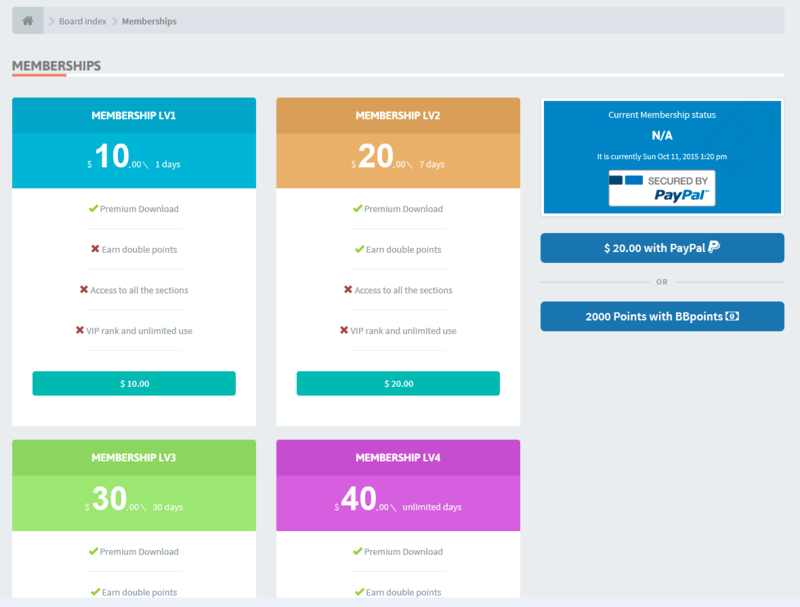 It allows users to select a membership package and pay for it via PayPal or even BBpoints (points system for phpBB 3.1). The Admin can configure the expiry time for each membership and also the group. Many handy options available included the Club mode to have a completely private forum and be opened only via membership. Let's get into some details on how to set it up correctly so you can start accepting memberships. The first thing to do you dont have any custom user groups is to create four basics groups. ACP (Admin Control Panel) > Users and Groups - Manage groups: Create new group (Add your groups name in the field) then hit "Submit"
You will be at the group creation page. Now its important to set the "group type" to "closed" so that the groups are only accessible via Memberships. Next you can set all the other options as you prefer. The settings should be straightforward and assuming you already have PayPal you will need to configure the membership settings with the user groups you previously created. Then set the amount and the expiration time in days. Optional you can set the group as default or even hide the membership package if you do not intent to use it and you might wish to use one package only. If you would like to make the forum private and accessible only with a valid paid membership you can activate the club mode. One the mode is enabled the users will be allowed to register but they will not have access to the forum until the purchase a membership package. If you wish to make the experience more fun and interesting for the users you can use the BBpoints extension to enable the "Pay with BBpoints" option. The setting is straight forward here as well, all you need to do is to enable BBpoints: marketplace.php?mode=view&item_id=30 and then set the point option to enable on the BBmembership setting page. How do I set up one package to have all options checked off (green)? UPDATE: Editing the memberships.php, search and change remove text-danger to ok text-green which turns all X's to green check marks. This is great if you want to offer two packages with the same thing, but with different expiration dates in (days). I'm wanting to allow users who use this to get access to maybe one or two extra forums normal users wouldn't get. Is there a way to allow only members who pay access to special forums? Without disabling my entire forum unusable unless someone pays for membership? Yes it is possible. Just create a Group like VIP and create permissions to that group to see ALL FORUM, and put Registered users (normal users) to see all forum EXCEPT those special forums. Very easy. Last edited by Leinad4Mind on March 6th, 2016, 5:05 pm, edited 1 time in total. What you would do is set the Registered users to "no" for: X forum and the Premium group to yes for X forum. You will need to fine tune the permissions based on what you think works best. For example "Can read" meaning can the registered user read the forum? or "Can view" Can the registered users view the forum? or should it be hidden? You might need to fine tune other groups you have created. I suggest reading the guide above to understand how to work with the permissions. Awesome thanks a lot for the quick response. I just got it. After install... I can't access memberships.php because it's not there. NGINX error: 404 Not Found. Your server URL rewrite settings are incorrect. First thing to check , ACP Server settings , URL rewrite. (enable it or disable it) depending on what the current state is.